To conclude our 'behind the image' series, we present our final image from the BMC Ecology Image Competition 2017. A serene landscape, peaceful, tranquil and isolated. Christin Säwström captured this magical image whilst riding a quad motorbike in Antarctica. I’m an Adjunct lecturer at Edith Cowan University, Western Australia. I was intrigued by the small invisible things that are all around us and particular their presence and role in nutrient cycling in extreme aquatic environments such as glacial melt pools and microbially dominated lakes. When I went on my first trip to the Arctic doing research in Svalbard, the beauty and sterile environment of the Arctic fascinated me. I kept this fascination of extreme environments, and continued and did my Ph.D. in the Antarctic where I got to experience the low light environment in the winter months. After my time in the Antarctic, I spent a few more years in the sub-arctic of Sweden, where again I experienced the beautiful low light environment that is associated with the polar winter months. The photo was taken on the sea ice in Prydz Bay in the Vestfold Hills, Antarctica. I took it with my old Nikon camera, a pretty standard camera and the photo was taken from the seat of my quad motorbike. I did part of my Ph.D. in the Antarctic and was there for just over a year; when this particular photo was taken in June I was heading back to the Davis research station from one of the huts called bandits hut after a “jolly trip” (i.e. weekend break away from the station) with my friends. During the winter months in the Antarctic and the Arctic, you get these fantastic pink skies as the sun never really rises above the horizon; in this photo I was lucky to get the moon in the perfect position between the two icebergs on the sea ice. I still remember the moment as we were riding our bikes on the sea ice in this eerie pink light and seeing the moon perfectly positioned between the towering ice bergs, just one of them moments that will be with me forever. 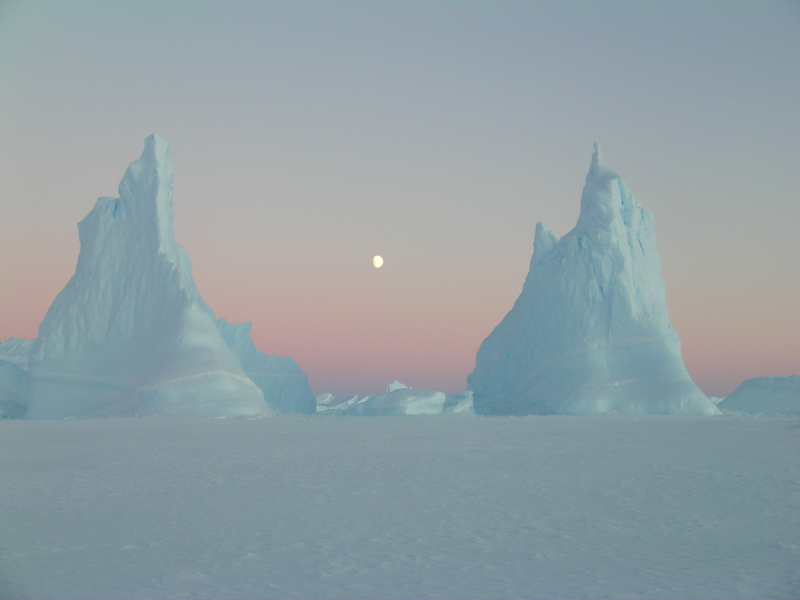 The eerie, but also soft, light of the pink Antarctic winter skies and the perfect symmetry of the moon right in between the icebergs.